I’ve worked with lots of anchors on TV. None did more to help establish who I am than Al Terzi. Al knows how to make those who work with him look better. For me that meant laughing at my jokes… even those only marginally funny. In blunt terms Al helped sell my persona to the viewers. This is often an ego-driven business, but Al worked hard to make his colleagues shine. Helaine called this evening asking if I’d spoken to him? Hadn’t I heard he was leaving WFSB? She pointed me to my station’s website when I pleaded ignorance. They couldn’t come to terms. He’d kept the decision quiet for a few months. He is leaving Friday. Al came to the hospital the night Steffie was born. He was the first person outside our family to hold her. He is deserving that honor. I will never forget. Here’s an Al Terzi secret. He can do an entire newscast while chewing gum! I have no idea how he does it, but it is totally unnoticeable on-the-air even if you’re looking for it. 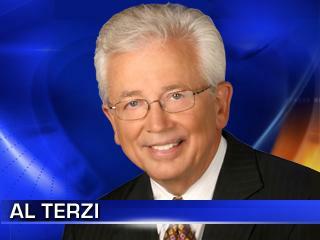 I can’t imagine Connecticut without Al Terzi on-the-air. Unthinkable. I grew up with Al on TV, always really liked him and his newscasts. I hope whatever the future holds for him is rewarding and enjoyable. OK — that’s it. No personal attacks in either direction, please. What is going on with those stations in CT? First you were let go from WTNH and now Al is being let go from WFSB-3? I sure wouldn’t mind if both of you came to the Tampa/St. Pete area, I wouldn’t mind watching 2 of my favorite TV guys on the 6PM News!! I am sorry to hear this. I echo Rose’s speculation that maybe he will show up at Fox (or was he there before?) There are still many Connecticut News stations he could join. I wish him the best. I met his son once while during a temp job at a mall. His son is also personable. It doesn’t seem like he’s being let go, but couldn’t agree on a contract. My guess Channel 3 wanted him to stay, but under their terms. It makes no sense at all to let him go. He’ll be a lightning rod wherever he ends up. At last they’re allowing him to stick around and say goodbye, and not give him the shaft like Channel 8 gave Geoff. I always enjoyed watching Al work with you, Geoff. You guys were great together. I will miss him on air–I watch WFSB when FOX CT isn’t on. I hope he gets another local opportunity. Sad..always thought highly of Al. Met him once at the iga in southington, i said hi. He absolutely ignored me like i wasnt there. Seems like a nice, caring guy on the air, then acts likes that, good bye. Very sad, he will be missed. al is the gold standard of a newsman..unflappable and has a great sense of humor..be nice if he does wind up on foxct..good luck al !!! I remember the goldie, oldie pre-cable days when he and Pat Sheehan were co-anchors on Channel 8. Our family loved that news show, and even though we lived in northeastern CT and the reception for Channel 3 and the Rhode Island stations was usually better, we always watched it. We were shocked when that team got broken up but followed Al to Channel 3. (But we returned to Channel 8 when we happened to catch the broadcast with Ann Nyberg. And Jeff was and is the best meteorologist on the dial. Why does everyone act so surprised when this happens??? Obviously he asked for more money and they said NO, and they probably even asked him to take a massive pay cut. Why in the world would they pay someone 300k a year, when they can get someone half his age to do it for 80k a year. This is not Breaking News. I’m surprised nobody has mentioned his son Tony. He was a DJ for a while at WKCI-FM 101.3 (KC-101.3) in the late 1980s and did sports for a time on WTIC-TV. By the way I like Al alot-he is truly a nice a person. take a pay cut. He had lightened his schedule on Wfsb he used to be on at noon. I do like him and Denise together she is so calm on the air, most of the other stations are pushing big hair, heavy make up and clothing that is questionable. I guess thIs is just a sign of times. I saw on the laurel website. The former Ms. CT is doing training to maybe be a weather person on. Wtnh, she is their CT 9 winner. What is up with that they are down to 3 weather people now. Geoff glad your on fox. I liked him on News Channel 8 back in the day! Anyone can read the news! I totally agree. One of the finest readers I’ve ever worked with didn’t have a clue what she was reading (I won’t mention her name). However, that’s not what’s important. A good anchor keeps the newscast from floundering when things go wrong – when copy is poorly written or video doesn’t show or a live shot dies. Think of Al (and other excellent anchors) like Sully. On most days it’s nice he’s there. On some days it’s critical. He will be difficult to replace without trading down. I grew up watching Pat Sheehan & Al Terzi on WFSB, Hilton doing weather & Dave Smith doing sports, legendary! 4 Men anchoring a newscast! Unheard of today; which is just fine. Kevin: Tony Terzi, a hugely underrated Dj, in my opinion. Dave: Respectfully, I tell you this: Try to read the news. You’ll quickly find out that not “anyone” can read the news. I have to agree with Dave, let’s face it. this is not brain surgery and most anchors don’t even know how to ad lib. The days of fat salaries are gone!!! Look at FOX News they’re all under 30 and hott and they can read the news. all the media people out there are in it for one reason to make a ton of money and they move from station to station to bump up there pay. good luck to Al terzi but no boo, hoos He will do just fine in his new job. Whoever is in charge of hiring and firing at these TV stations need guidance badly! What are they thinking??? I just found out Kristin Cusato, Sara Welch and Mr. Coppey? had left Channel 8 awhile back…what a shame I enjoyed watching them. I don’t watch that station anymore anyway but still! I’ll miss Al, one of the last “greats” to leave. I admire him in many ways, especially how he kept his departure quiet. He didn’t feel the need or desire to bring it to Ct’s attention, as others have done. He knew when the time was right it would be announced. He needs no one to plead his case. As Vinny stated, Al will do just fine in whatever he chooses to do. I wish him well. A true class act. We’ve followed him from station to station over the years. His professionalism is outstanding. I hope he finds something suitable. Thanks for standing up for him, Geoff. Sounds like he may have some plans – wonder where he will wind up? I’m sorry to hear Al is leaving, I grew up watching him on the news as I did you Geoff, before I moved to San Diego, CA.,over 20 years ago. It seems like all the news anchors I watched are all leaving, best of luck to all of them!!! !